I'm pretty much giving up hope on getting a batch of hops this year. Houston followed up the wettest July on record with the hottest August (and the month isn't even over yet). The almost constant rains of July didn't give the soil much of a chance to dry, slowing growth and cause the leaves to yellow. Now the ridiculous heat of August is taking its toll as well. If anyone else is growing hops in Houston, I'd love to hear about your results for this year. Both plants are continuing their recover and have a lot of new growth that's starting to replace all the leaves that mysteriously died off. The Cascade has grown a lot of new leaves and there are quite a few new bines racing up the twine. The new growth on the Nugget is appearing much slower, making the plant appear very thin and unhappy. It looks like both plants are getting back on track, but I'm not feeling very positive about the chances of getting a good crop of hops this year. The photos below show all the new growth on the lower portion of both plants with the Nugget on the left and the Cascade on the right. Unfortunately, I still haven't been able to determine the exact nature of the problem that is causing the leaves to turn yellow and rust and fall off. Its difficult to research it online and the posts I created on a couple of hop growing forums didn't yield any good suggestions either. Its been extremely hot lately and the plants may be getting stressed from the heat and sun. We've also had sporadic heavy rains showers which is keeping my lawn long and green, but could be preventing the soil in the pots from being able to dry out completely. To compensate for that, I turned off the drip irrigation system and I've been monitoring the soil moisture level and manually watering only when needed. However, I can't prevent mother nature from continuing to water them for me. I did receive a suggestion from a friend to spray the plants with a Liquid Seaweed fertilizer solution. Liquid seaweed is a very low nitrogen fertilizer with more than 70 minerals, vitamins and enzymes that could aid in the plants recovery. Over the past few days, the plants do look like they're actually starting to improve. Although they lost a lot of their existing leaves, both plants have started to sprout new growth and leaves to replace what's died. Hopefully they're able to fully recover from whatever the problem has been. I returned to this horrible sight after being gone for the weekend. 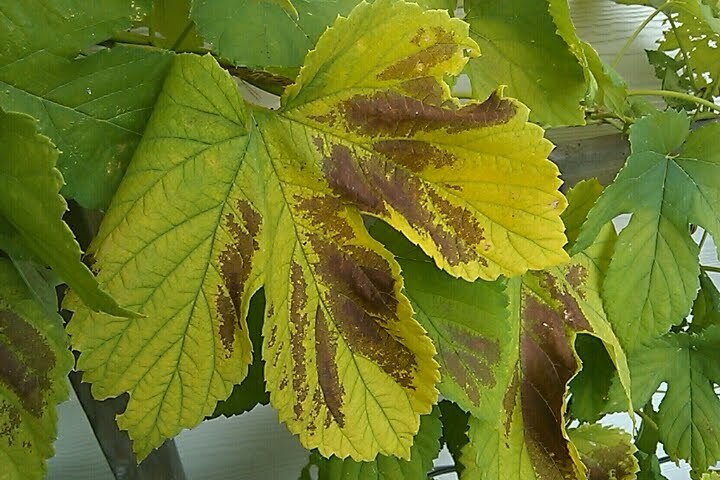 The leaves on the Nugget plant have turned pale yellow with large brown/rust patches on them. At this point, the Cascade plant isn't showing any of the same issues. Leaves are dying off on the lower portion of the plant, but that's normal. I checked the ph level of the soil and its between 6 and 6.5 which is within the preferred range for hop plants. I'm attempting to research the issue online, but if anyone reading this has any ideas or suggestions, please feel free to comment. The daily temperature is now well into the 90's with the heat index in the 100's on some days, so I finally made the decision to move the hop plants. They'll now get sun from the around 7am to about 1pm but shade them during the hottest times of the day. Also gave them both some liquid miracle grow fertilizer and watered them well after the move. The cascade plant is continuing its growth spurt with the nugget not really doing much at all. The bines on both plants have slowed down their growth rate and are not increasing in length nearly as quickly. However, the good news is that both have started developing some nice hop cones. Once cones start to develop, you need to check them often to get a feel on how they're are developing so you know when they are ready to be picked. I've done a lot of searching online and the general consensus is that the cones should be a yellowish green to a light green in colour and feel relatively light and dry. If you squeeze the hop cone and it stays compressed, then they are not ready to be picked. Some of the Cascade cones actually look like they may be ready and have plenty of yellow lupulin in the cones when I pull them apart. I made an adjustment to the drip irrigation system to help ensure more uniform water distribution and moisture level. Each pot only had two drippers which didn't seem to be uniformly distributing moisture around the soil. I added a third dripper to each pot and the tubing now goes in a U shape around the plants (see photo to the left). This should help ensure the whole root system is getting water. And based on how fast the bines are continuing to grow and develop hop cones, the plants are obviously needing a great deal of it. I also adjusted the twine at the top of the trellis to try and give the Cascade bine more room to grow. The bine now goes horizontally across the top cross-bar and then back diagonally to the top. I guess when I reaches the top again, I'll just make it grow back down the other side. I could also just extend the pole a few more feet and add on some more cross bars which is what I may end up having to do. The Cascade bine has now reached the end of the line at the top of the pole which makes it over 15 feet in length. Not sure what I'm going to do with it now, but I guess I could just keep letting out more twine from the top and let it droop down. I figured the bines which eventually reach the top, just not so quickly. More hop cones are continuing to develop on the Cascade and the existing ones are getting quite large. Some of the bines on the Nugget are starting to grow side arms now which will lead to hop cones as well. 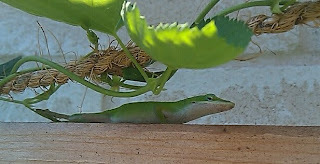 While doing my daily check of the plants, I found a few of these little pests on some of the leaves. I noticed small holes starting to develop in some of the leaves and this explains why. I must have killed at least a dozen of them today, but they're hard to find since they're on the underside of the leaves. They're voracious eaters and grow quickly. They also turn green as they grow larger making them even harder to spot on the leaves. 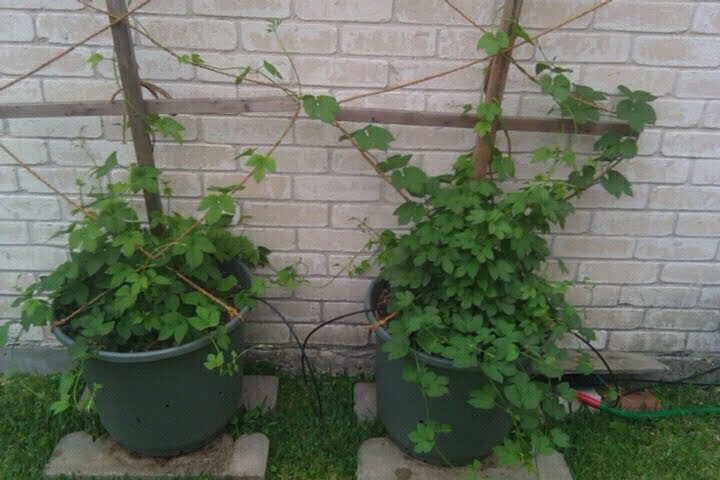 We have had beautiful weather in Houston over the past few weeks, weather that the hop plants obviously love. They have both experienced incredible growth rates and the Cascasde developed hop cones over the weekend! I didn't get first hop cones until we were into June last year. The cones (in the photo to the left) are on the middle of the main bine which is already over 15 feet long. More side shoots are starting to develop over the length of the bine as well as on a couple of the other ones. 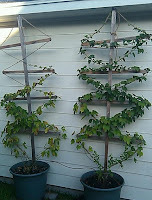 The photo to the right was taken from top of the pot looking up the pole of the trellis. From underneath, you can really see how the bines have wrapped around the twine and each other as they've grown. 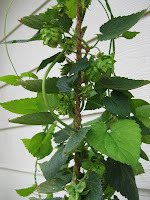 I've done a lot of reading about growing hops and frequently browse a couple of online hop growing forums. Some of the posts I've read suggest that all growth up to now should be cut down to the ground to make the plant start over again. The reasoning behind this seems to be that hops that develop early in the season will have a "grassy" flavour to them, possibly caused by the heat. Making the plants start over will ensure the hops develop later in the season. However, that seems to be more of an opinion with was just as many that disagreed with it. So, since this is only my second year growing them and I only have two plants, I'm going to just let them grow and harvest the cones as they become available. 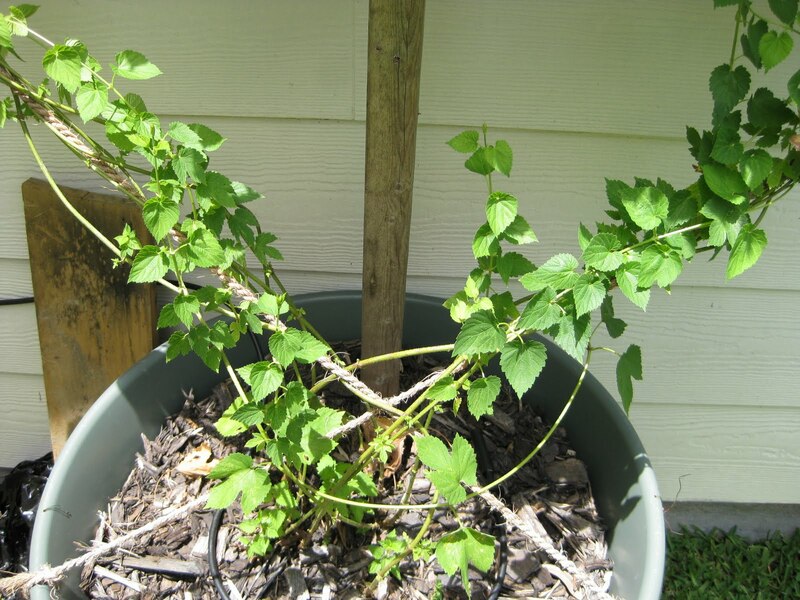 Eventually, I'd like to have few more hop plants and then I can actually experiment with them and get a better idea of what works and what doesn't for growing hops down here in Texas. I've continued to monitor the wetness of the soil and adjusted the watering schedule accordingly. I like the soil to get fairly dry between waterings, but not enough to make the plant wilt. I also fertilized both plants with some liquid Miracle Grow fertilizer. Some of the leaves on the Nugget are getting huge. Here's some that are as big as my hand. I guess they're basically like solar panels for the plant, soaking up energy from the sun. Hopefully big leaves aren't actually a bad thing and causing the plant to use too much of its energy supporting them. Thinned out some of the new growth around the base of the plant and removed a few new bines. I probably still have too many bines per plant, but both are continuing to do very well and look healthy and bushy. A bine from the Cascade (right) is now almost at the third bend in the twine. Even though the twine is on an upward angle, some of the bines still try to just grow straight up and I often have to spend a few minutes a day wrapping the new growth around the twine. The temperatures have been in the high 70's during the day with plenty of sunshine which the plants obviously like. They're currently getting watered every second day to allow the soil to dry out which will get adjusted as the daytime temperatures increase. It really was a tangled mess in there, particularly the Cascade. The tips of the bines are also delicate and very easy to break and once that happens, that bine won't grow longer. That actually helped with the thinning process as I just completely removed the bine if I accidentally broke the tip trying to untangle it or wind it around the twine. I ended up training more then just two or three bines per twine though, as there were so many healthy and strong ones and I just couldn't bring myself to cut them back. One of the Cascade bines is already rounding the second bend in the twine which is making me think that its going to reach the total length of 14 feet pretty quickly. Quite the tangled mess. I had a feeling that's what it would look like when I got back with no one around to train the bines onto the twine. One of the bines from the Cascade plant had crossed over and started growing up the twine on the Nugget pot. Bines are braided together as they climbed each other and others are wrapped around the support pole. Quite a lot of growth for only five days. I'll have a bit of work to do this afternoon to untangle the mess and figure out which bines to keep and get them wrapped around the twine. The rest of the bines will be cut off so the plant can concentrate on growing the main bines. I'll probably keep four to six bines per plant (two to three per twine) and cut back the rest. I finally got around to finishing up the trellis this weekend, but I didn't end up modify the overall design from what I used last year. I decided that I still wanted to be able to move the plants (pot and trellis) to adjust for sunlight and in case of any hurricanes and any more elaborate trellis designs would need to be a permanent structure. 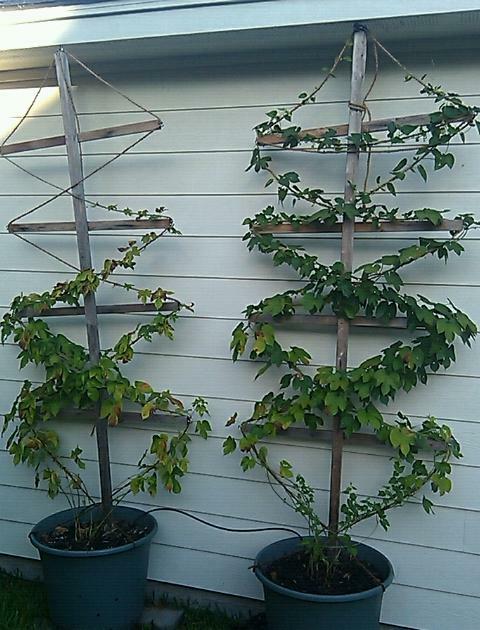 I added two more cross bars to each main trellis support and then criss-crossed the hop twine to the top. This provides about 14 feet of twine for the bines to grow on until they reach the top. At that point, I'll either need to pinch off the top of the bine or come up with some other workaround for extending the twine. The Cascade plant in the photo is already happily growing along the twine and has reach the first bend. I also installed the drip irrigation system, but I still need to adjust the flow rate before I turn it on. I also need to buy some new and add a fresh layer to the top of the pots. I feel bad that I've been neglecting my hop plants and yet they're already doing so well. 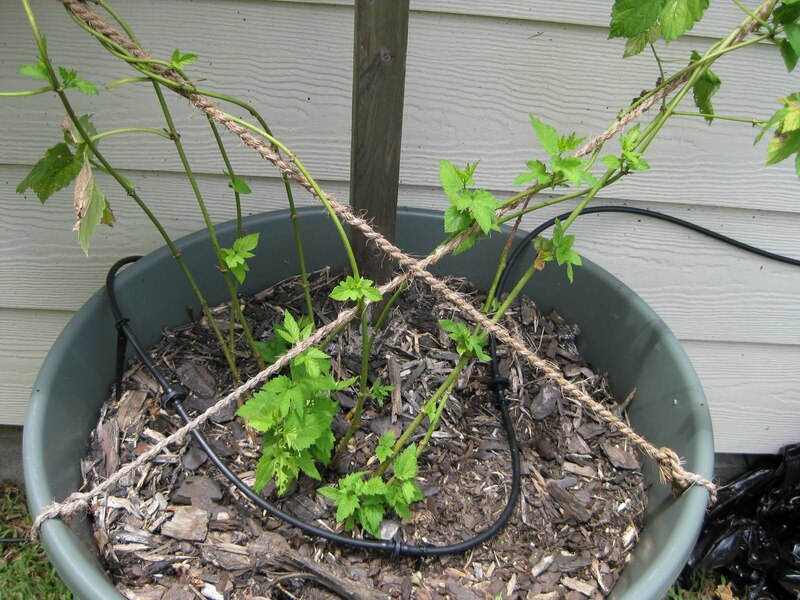 I really need to get the hop twine up as the Cascade is already in need of something to climb on. We've had enough rain lately that I haven't had to worry about watering, but I do need to get some good fertilizer on them and a new layer of mulch. I noticed some weeds starting to sprout in the hop pots at lunch and when I went to pull them out, I saw some hop sprouts already sticking up from the soil. I didn't even plant my rhizomes until March 28th last year and here it is only March 12 and I've already got first growth! Glad to see they made it through our "cold" Houston winter. I'll move the pots around the corner to the south side of the house this weekend so they can start getting more sun. I should probably give them some fertilizer too. 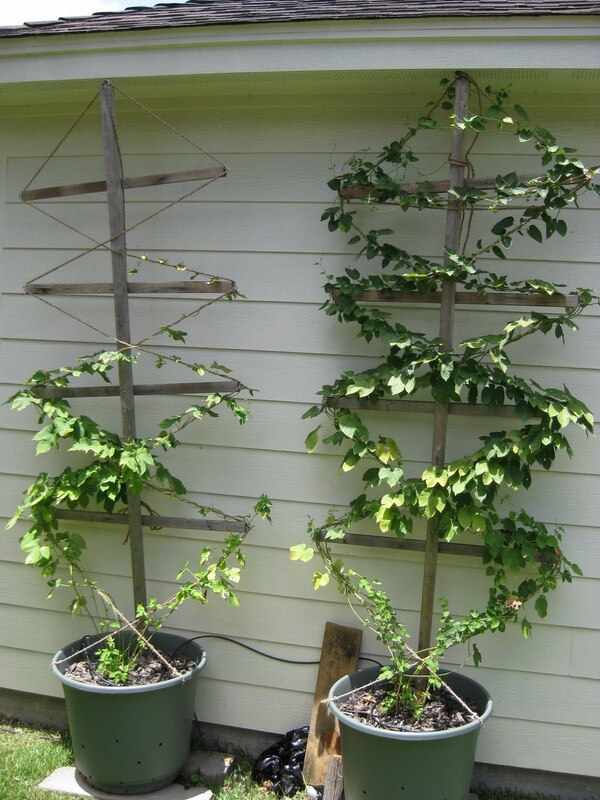 It also means I definitely need to starting thinking about my trellis design for this year and weather I really want to plant more hops or not. It's the beginning of March and now is the time to start planning your hop growing season. If this is your first year at it, you need to begin thinking about what varieties to grow, how many rhizomes you want to plant, where to plant them, what type of trellis system you will use, etc, etc. If this isn't your first year, then its time to reflect on last years growing season and think about what worked and what didn't and if any changes are necessary for this year. Last year was my first attempt and I would consider it to be pretty succesfull. Although I didn't get enough hop cones for a full batch of beer, both plants did very well and both produced a pretty good amount for a first year. 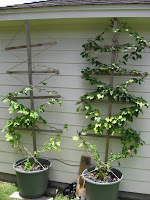 I need to start think about the trellis design that I'm using and if there are any changes that I'd like to make to it. I like the overall concept that I'm using now as it allows for the entire plant (pot and trellis) to be moved and relocated as the summer heat and sun increases and in case of hurricanes. I'm also considering planting one or two more rhizomes this year. The Brew Your Own Magazine website has a list of shops that sell hop rhizomes and some are already taking orders. Check out the list here. This was my first attempt at growing hops and it was a great experience. Many people I talked to or chatted with on various online forums basically said hops wouldn't grow in Texas. Unfortunately, a lot of the information available in books and online regarding sunlight, moisture, nutrients and soil are written for growing hops up in the Northwest and isn't necessarily relevant when growing hops this far south. 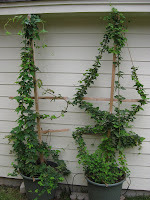 Luckily, I had recently read an article about growing hops in pots by Chris Colby of Brew Your Magazine (who has been growing hops in pots in central Texas for years) so at least I knew it could be done. The ground soil is terrible here and our yard does not have very good drainage. 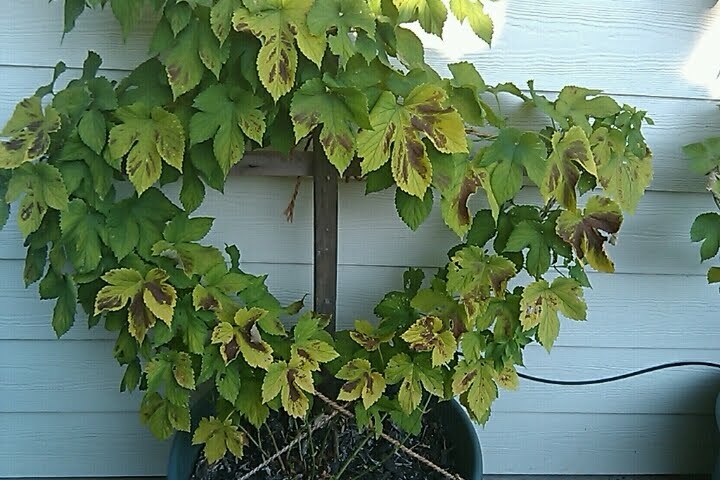 I knew hop plants need a lot of direct sunlight, but I had a feeling they would need some shade during the hottest parts of the summer. That was true more then ever this past summer as it was the hottest and driest summer ever for the first half and then almost constant rain for the second half. 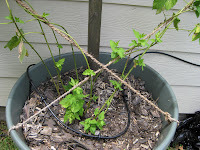 Growing hops in pots seemed like the best option as it allowed me to provide good soil with adequate drainage and the ability to move the plants to different areas of the yard to adjust for sunlight. Monitoring the soil conditions turned out to be a lot more crucial then I had anticipated. Although I thought I had drilled enough drain holes in the pots, it apparently wasn't as the soil started to remain too wet in the lower half of the pots which started to affect the plants. I was able to remedy that by simply drilling more holes and purchasing an inexpensive soil moisture meter allowed me to check the moisture at different levels in the pots and adjust the drip irrigation system. The types, amounts and frequency of fertilizer and nutrients to provide is almost impossible to determine. Most of the information I found online was very vague and often contradicted information that I found elsewhere. Arguments would almost break out over it on one of the hop growing forums that I would check often. Basically, the growing conditions for everyone will be different, so there's not going to be any blanket advice that covers all options. I just watched the plants and tried to adequately adjust the water, light and nutrients as the plants grew. Once the hops starting to grow, they really took off fast. A lot faster and longer then I anticipated. 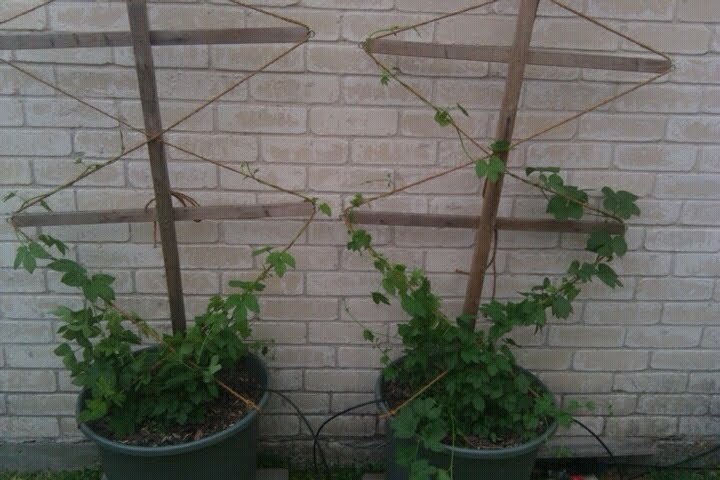 I ended up modifying the original hop trellis design by Chris Colby as I didn't like the idea of the loose bines hanging on the ground and flapping around in the wind. I'll definitely give some thought to the trellis design this winter and see how I can improve on it. Overall I'd have to say that the first year of my first attempt to grow hops was quite successful as I did get hops from both plants (although not enough for a batch of beer). The fact that I got any was a great sign that I did something right. Most hop plants don't produce very many hop cones (if at all) the first year and given the weather conditions that I had to contend with, I consider myself lucky that I got what I did. The bines are almost completely dead now and I'll probably cut them off at the surface level this weekend. This will probably be the last post for this season. I'll start posting again as I begin preparations for next season. I've received a few email messages from readers asking questions and I'm happy to continue to reply to any email messages that I receive. I picked some of the larger Cascade hop cones that were ready this weekend, vacu-sealed them and put them in the freezer. I'll just keep picking them as they become ready and seal them as well. While picking these, I noticed there's one bine on the Nugget plant that has a nice bunch of pretty large cones as well. Those are basically the first cones that the Nugget has produced this year. I've been neglecting this blog, but not my hop plants. In fact, there's been a resurgence of growth over the past few weeks. The plants are clearly enjoying the much cooler weather and they're looking much bushier and happier. When we returned from our trip to the Pacific Northwest, I could see over a foot or two of new growth on multiple bines and side arms which I had to detangle and get wrapped around the twine properly. And along with the new growth came a bunch of new hops! Some of them are looking quite large and better the then hops that developed earlier. There is actually quite a lot of hop cones on the Cascade and some are looking like they're probably ready to harvest, but unfortunately, they're all pretty small. I had hoped to at least get enough to add to a batch of beer for flavour and aroma but at this point, that would be purely ceremonial. Oh well, it was just the first year and wasn't really expecting to get much. I also blame the weather. This was the hottest summer on record and also one of the driest, so not the best year to attempt to grow hops. Chris Colby at BYO Magazine had problems with his hop production this year that he attributed to the heat as well.